According to historian and associate professor, Eirinn Larsen, those embarking on a research career should travel out into the world as early as possible, at the master’s level if possible, and certainly as part of a Ph.D. Currently living in Norway and working at the University of Oslo’s Department of Archaeology, Conservation and History, Dr Larsen completed her doctoral degree at the European University Institute in Florence, Italy, after having studied in Iceland and the US. She also participated in summer courses in Germany and the Netherlands and started archival studies in Paris for her doctoral degree. She subsequently returned to Berkeley for a six-month research stay and her future plans include a work-related stay in Australia. Taking on responsibility for your own progress forces you to become independent, and a research stay abroad brings with it new perspectives and experiences,” Dr Larsen says. Our conversation will be focused on funding opportunities for those research fellows and researchers who are interested in working abroad, as well as where to find help on formal and practical issues. When Dr Larsen first went abroad in the beginning of the 1990s she had to organise everything on her own. The situation today, with the EURAXESS – Researchers in Motion initiative in place, is completely different. More on the EURAXESS network below. Students and research fellows need to be encouraged to undertake a research stay overseas. There are a variety of mobility schemes available for researchers and doctoral and postdoctoral fellows alike. Eirinn Larsen’s first academic foray abroad was on a grant from the Nordplus Higher Education Programme to Iceland to study history, ethnology and Nordic studies, contemporary Icelandic and literary studies of the sagas. “Of course you should go to Iceland!” her professor assured her. During your education or early in your career when you don’t have a large network, it means a lot to have the encouragement of supervisors and other academics and to get help with letters of recommendation, Dr Larsen says. Eirinn Larsen applied for a doctoral fellowship at the European University Institute (EUI) in Florence after spending a year in Paris at L'Ecole des Hautes Etudes en Sciences Sociales (EHESS). She had learned about the EUI a few years before that, while studying in Berkeley, California, from some EUI students who were also there on an exchange programme. EUI accepts doctoral students in political science and social sciences, law and economics, and Eirinn Larsen’s own subject field, history and civilisation. When Eirinn Larsen first heard about it, Norway did not yet have an agreement with the EUI, but that had changed by the time she started her doctoral degree project after a short break from academic life. 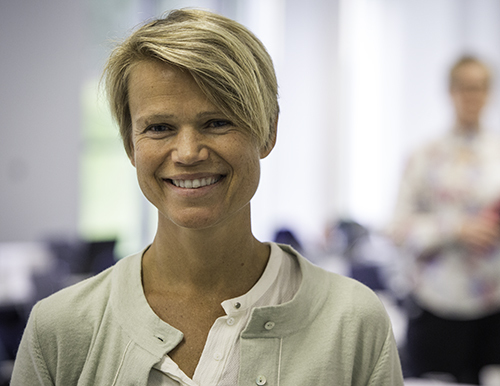 She took part in a comparative European project and completed her doctoral degree in connection with this, in affiliation with the Centre for Business History at the BI Norwegian Business School. She submitted an application to EUI and was accepted for admission in autumn 2000 on a doctoral research fellowship from Norway. She looks back on her time in Florence with great fondness. It was an intensive programme, but one that gave her a great deal both professionally and personally. Being a Norwegian doctoral student at EUI has its privileges. We receive more in funding than the others and have the same rights as Norwegian doctoral students. The terms are exceptional. In addition, I was studying in an international environment with access to the most beautiful area of Europe. The only thing I felt was missing was the opportunity to teach. There are no teaching requirements there, Dr Larsen explains. Her comparative project task dealt with the development of higher business education in France and Norway and the role of gender and masculinity over a 100-year period. She learned French while working on her doctoral degree. Master’s students interested in pursuing a doctoral degree at EUI should note there is a yearly application deadline of 31 January. Applications for 2018 will be made available online on 2 November 2017. The relevant subject fields are law, political and social sciences, economics and history and civilisation. International experience is a must for researchers with any ambition of securing international funding ,states Eirinn Larsen. This applies to grants from the European Research Council (ERC), among others. She has not applied for funding from the ERC, but is considering doing so. The ERC views it as essential that applicants demonstrate independence in their careers. International experience is a big plus in that regard – even when it comes to Starting Grants, which are oriented towards young researchers with only two to seven years of experience after they have defended their doctoral theses. Competition for this type of international funding is keen. After completing her doctoral degree, Eirinn Larsen returned home to Norway together with her Australian husband, whom she met at EUI. She was hired in a permanent position at Uni Research Rokkan Centre in Bergen. It was no coincidence that the University of Bergen was the first to open its doors to her, as she had completed her full undergraduate and first-level graduate studies there as well. One potential disadvantage of traveling abroad is researchers may lose contact with the institution they have been part of throughout their studies. It’s difficult to get a foot in the door when coming from the outside – even though I’m Norwegian and have an international doctoral degree , Dr Larsen points out. Consequently, Dr Larsen had to become reacquainted with the Norwegian academic community after returning to Norway. She took part in a number of interdisciplinary research projects and ended up in Oslo, partly because Bergen proved to be too wet and cold for an Australian over time, she explained. It is possible to travel abroad early while still maintaining contact with your home institution: The FRIPRO mobility grant is available to young researchers in all subject areas in the first years after they have completed their doctoral degrees. FRIPRO mobility grants have a three-year timeframe. The first two years are to be spent at a research institution abroad with the third year at an institution in Norway. The application deadline for a mobility grant each year is in April. For some individuals a stay abroad may lead to further work at a foreign institution whereas others return home to Norway. Dr Larsen found that the positions available to her abroad as a recent graduate in history did not offer her a liveable wage. In addition, historians are expected to work with their own country and language as their starting point,” she says. Eirinn Larsen also discovered that it is not easy to establish a career in research just anywhere while trying to start a family at the same time. She points out that Norway has its comparative advantages. In Norway the working conditions are good and we have social benefit schemes that go a long way towards compensating for a moderate salary. I think that is an important point to stress. We have access to benefits that academics in other countries don’t have. It is much easier to balance family life and a research career in Norway than elsewhere, and that obviously means a great deal for women who intend to pursue an academic career and a family life with children. We should be extremely thankful for the welfare system we have,” she stresses. Her years abroad have given her experiences, adventures, knowledge and insights that she now carries with her. In addition, it is easy to get in touch with those she has met and worked with. It is easy to pick up and go for another period abroad. Travelling to another country gives one greater freedom. There is something to be said for working a completely different place for a while. It shakes up day-to-day life. There are fewer regular family obligations, there’s more time for the family and for yourself, and you become more open, she explains. Experience abroad also gives people a special understanding of what it is like to live in a foreign country, particularly in terms of what the Norwegian academic community does to welcome foreign research fellows and researchers who come to stay in Norway. The first time Eirinn Larsen left Norway there was no EURAXESS, the network that helps researchers with everything from dealing with formalities to providing practical assistance in connection with living abroad. Anyone planning, or considering, a first-time stay abroad can take advantage of the EURAXESS Contact Points at his or her own institution (provided that they provide support for research stays abroad) or at the targeted host institution. answering all the most common questions in connection with a stay abroad, such as whether she and any accompanying family members would be able to retain membership in the National Insurance Scheme and/or if insurance is needed and how to deal with tax issues. meeting practical challenges such as obtaining a visa/work permit, finding a place to live and opening a bank account in the host country. becoming better acquainted with the local culture and language and important questions about the local society such as how health services work, what the available pre-school and school programmes are for accompanying children and the like. understanding the local labour market and receiving assistance for spouses or partners to find employment. establishing contact with other international researchers through local networks in the host country. Research Council Overseas Research Grants are available to doctoral and post-doctoral fellowship-holders affiliated with a project that has received a pledge for full or partial funding from the Research Council for a period of minimum 24 months. The research stay abroad must have a duration of minimum three months and maximum 12 months. The Overseas Research Grant is available to participants in projects that have been awarded Research Council funding as from 2017, under any programme except the FRIPRO independent project funding scheme. The Overseas Research Grant may be sought by participants in FRIPRO projects awarded funding prior to 2017. FRIPRO Mobility Grants are oriented towards young research talents in all subject fields. The grant has a timeframe of three years. Two of these years must be spent at a research institution abroad and one year at an institution in Norway. Applicants must have formally submitted their doctoral thesis at the latest by 1 November of the year the grant application is submitted and their thesis must be defended and approved prior to project start-up. No more than six years must have passed between the date of the successful defence of a doctoral thesis and the application submission deadline. Funding for mobility is available through the European Commission’s Marie Sklodowska-Curie actions (MSCA) as support for Innovative Training Networks at the doctoral level or as Individual Fellowships at the postdoctoral level. The MSCA COFUND scheme is also available for applicants at the doctoral and postdoctoral levels. MSCA grants are open to all subject fields and thematic areas. The application deadline is in September each year. Candidates awarded an MSCA grant may seek top-up financing from the Research Council. Other funding opportunities for research stays abroad include the Fulbright scholarship for stays at research institutions in the US at the master’s or doctoral level or for researchers/lecturers for a period of three to twelve months. The yearly application deadline is 1 October. Are you part of a research project and looking to establish an international network or expand the one you have? Then the European Cooperation in Science and Technology (COST) may be of use to you in determining whether you can participate in joint projects (actions) on the basis of your project. A list of relevant actions is available in the right-hand column of the Research Council’s COST webpage (see link above). New COST actions are set to be initiated in the near future. Mobility schemes can become part of your career track if you have ambitions within your field and emerge on top in the competition for funding from the ERC or other international schemes. Visit the Research Council’s website for tips on funding opportunities.